The size of California, both geographically and population wise, makes California comparable to many countries. Heres how California stacks up to the rest of the world. 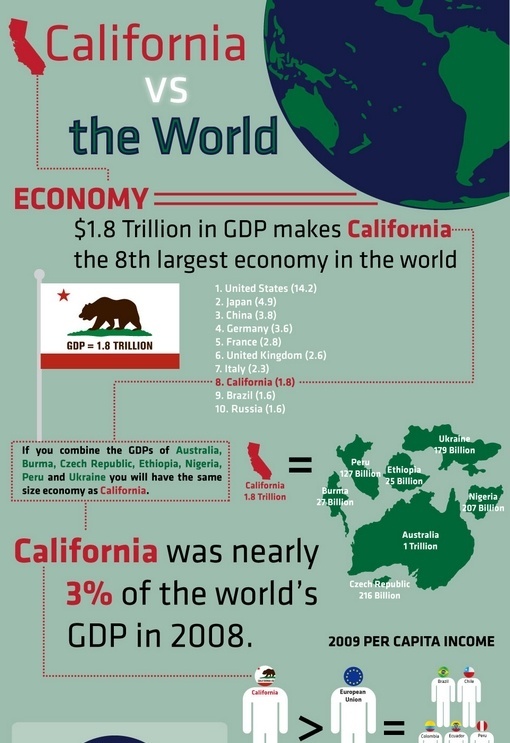 Californias $1.8 trillion GDP makes it the 8th largest economy in the world. The United States as a whole has the largest economy in the world, with a GDP of $14.2 trillion. Japan is number two with a GDP of $4.9 trillion. China has the third-largest with a GDP of $3.8 trillion. Number four is Germany, with a GDP of $3.6 trillion. The fifth-largest GDP is France, with $2.8 trillion. Number six is the United Kingdom, with a GDP of $2.6 trillion. Number nine is Brazil with a GDP of $1.6 trillion. Number 10 is Russia with a GDP of $1.6 trillion. If you combine the GDPs of Australia, Burma, the Czech Republic, Ethiopia, Nigeria, Peru and Ukraine, you will have the same size economy as California. California accounted for nearly 3 percent of the worlds GDP in 2008. How Long Would You Have to Work to Earn as Much as a Top CEO?